Playcore, a playground equipment company, came to HQ seeking a companion app to track the usage of their Gametime Challenge Courses. This simple app presented some interesting challenges that our design and development team couldn’t wait to tackle. 1. Location: The vast majority of users will attend the same challenge course every time they use the app. To accommodate this behavior, we allow users to select a “Home Course” in the onboarding process. Their Home Course will automatically display when they start a new challenge, to save them a little time. 2. Solo or Group? : Right up front we allow users to choose if they are running by themselves or with a group of people. Although the app was fairly simple, we had a lot of different folks to keep in mind. Our primary users were late elementary children and young adults. We also accounted for families, physical education students and teachers, Park Managers and City Stakeholders. When you combine the needs and motivations of all of these users you end up with a flexible timer app that can handle solo runners, large groups and analytics that keep track of park usage. Playcore needed to launch with both an Android and iOS version of their app. We utilized the native visual languages from each platform so that users were comfortable within their respective ecosystems. This approach also kept design and development costs in check and accommodated a tight timeline. The home screen gives users the clear option of starting a “Solo” or “Group” challenge. Both choices land users on a Challenge Creation screen where they can manage Location and/or Groups. Solo: Since users are participating in strenuous activities we made the timer button very obvious and easy to interact with. When solo users stop the timer, their final time is displayed along with their previous times so that they can compare. Group: Timing a group of users is a tall task so we developed a scrolling list of timers. This will allow gym teachers, soccer coaches and parents to keep track the runner who are “Done”, “In Progress” or “Up Next”. When the group is done running the challenge course they can sort the results to compare each others times. 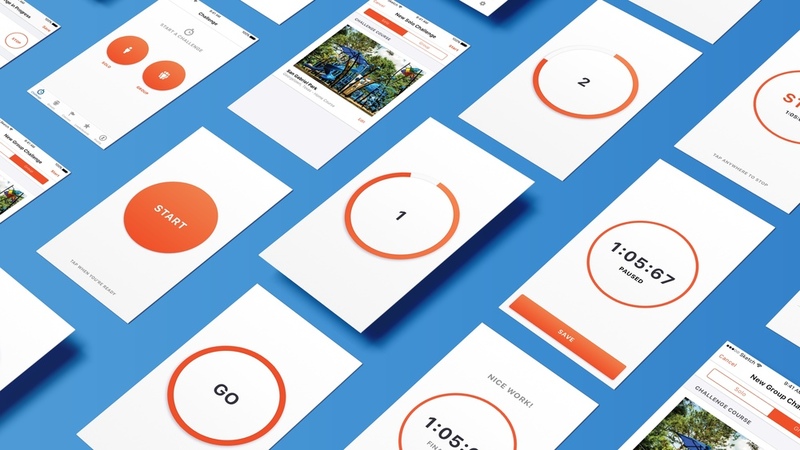 The Gametime app was Playcore’s first step at integrating app components into their products. In addition to helping users track their time, this app will become an analytics tool that can help Playcore show the useage and effectivness of their products.